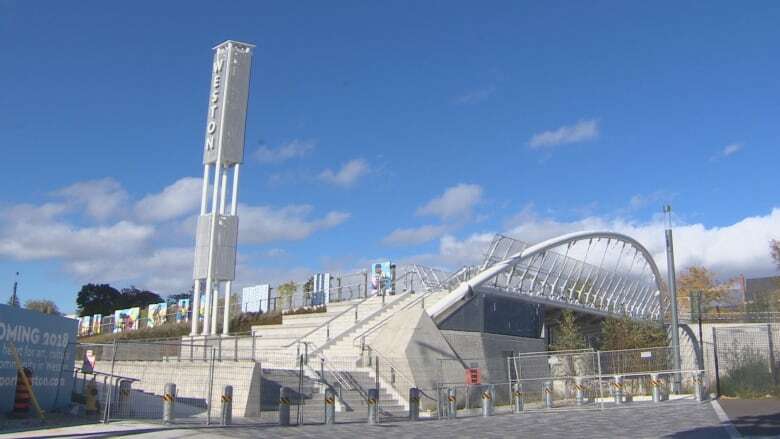 After a string of delays, the province's transit agency, Metrolinx, is finally taking down the barriers blocking the entrance to the new pedestrian bridge near the Weston GO station. Residents and business owners near the Weston GO station are welcoming the news that Metrolinx will finally open a nearby pedestrian bridge Friday that was supposed to be opened last fall, but they're also wondering what took the regional transit authority so long. For the last few years, Tom Murison's walk to his local barber shop has taken three times longer than usual, due to construction. "Three years ago, I guess they shut down the cross over while they were doing the [Union-Pearson Express] development and since then we've had to hike around," Murison said. The bridge goes over the train tracks and reconnects the residential side of John Street to the more commercial side near Weston Road. For many residents and shop owners in the area, the wait has been long and frustrating. 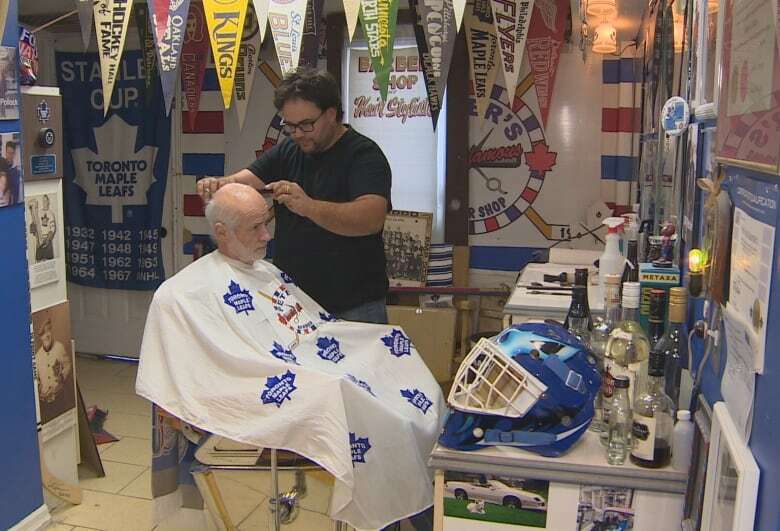 Peter Kalamaris's family has owned a barber shop on John Street for nearly 60 years. "We've been promised this bridge for so many years now," Kalamaris told CBC News. "We're not building the CN Tower again, it's a simple pedestrian bridge. What's the problem?" Erin Moroz, a communications and public affairs executive at Metrolinx, says part of the delay stemmed from an international design competition for the bridge. "In that international design competition we also ran into things like back-ordered security fencing from Germany," Moroz said. Then, there was another delay: figuring out which upkeep and liability responsibilities belong to the city and which belong to Metrolinx. Typically, it's the city that is responsible for the general maintenance of the bridge, which includes things like snow removal. The city says it asked Metrolinx to open the bridge in September of 2015, even though the negotiations were ongoing. But Metrolinx said no, citing that it can't until liability, safety and maintenance issues are resolved. "Metrolinx has constructed a bridge and we're negotiating the terms and conditions of the turnover of that bridge," said Deputy City Manager John Livey on Wednesday morning. "When it's open to the community, we want the community to be assured that that will be maintained in a way that is responsible and usable for everyone," said Moroz. The city councillor for York South-Weston, Frances Nunziata, says she doesn't understand why Metrolinx wouldn't allow the bridge to be used while the paperwork was being figured out. "I mean at the end of the day the bridge was built, there were permits given, so why wait?" Nunziata.said. Residents in the area also got their local MPP, Laura Albanese, involved. On September 30, Albanese sent a letter to the president and CEO of Metrolinx, Bruce McCuaig. "We have contacted your department several times to obtain a more definite response and a date to communicate to the community with no success," Albanese wrote. "I ask that Metrolinx please work towards expediting the opening of the John Street Pedestrian Bridge." CBC News had been in contact with Metrolinx since Tuesday morning. On Wednesday afternoon, Metrolinx emailed saying that an interim agreement had been reached Tuesday night and that the bridge would be operational no later than Friday. Still, many in the area, like Peter Kalamaris, don't understand why it was so difficult to figure out who is responsible for what parts of the bridge. "You'd think that with a project of this size that someone would ... say, 'Hey, this is my baby,'" Kalamaris said.